Talk about a hot hand. 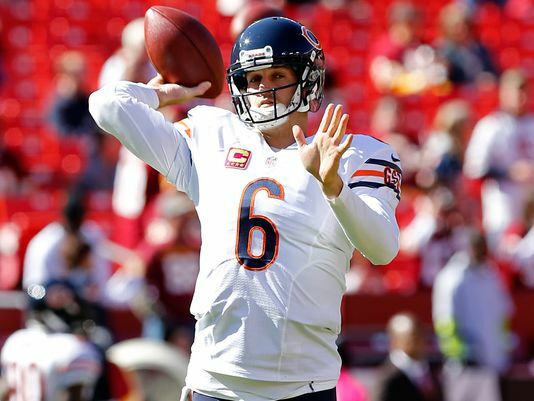 Josh McCown is the first quarterback in Bears history to produce three consecutive 300-yard games, which is impressive enough when considering that Papa Bear Halas established the franchise in 1920 and notables slinging the rock for Chicago have included Sid Luckman, The Punky QB (Jim McMahon) and, well, Jay Cutler. It resonates further when taking stock of the conditions the last time out. On a frigid night (temperature at kickoff: 8 degrees), McCown felt hotter than a branding iron to a woeful Dallas defense, passing for 348 yards and 4 TDs. And for the first time during an 11-year NFL journey that has included stops with five teams, McCown was honored as the NFC’s Offensive Player of the Week. Cutler will start Sunday’s game at Cleveland, back from a four-game layoff to find the Bears (7-6) very much alive in the race for the NFC North title, thanks to the bumbling Detroit Lions. With the season on the line on any given snap, the debate over Marc Trestman’s decision to re-insert Cutler in the lineup may be just heating up. No doubt, there’s some strong sentiment that suggests Trestman is out of his pretty mind for sitting McCown down, based on merit. For the season, McCown has completed nearly 67% of his passes, with a 13-to-1 TD-to-INT ratio. He ranks third in the NFL with a 109.8. “In my opinion, he should be the starting quarterback of the Bears, even if Jay Cutler is healthy,” said freshly-retired Brian Urlacher, the former Bears linebacker now analyzing for Fox. “You can’t take a guy who’s this hot out of the football game. Urlacher’s view is welcomed, obviously, as someone who was so integral to the team for more than a decade. But he should lighten up. My guess is that as the face of the franchise for so many years, he would have screamed bloody foul – even as his play declined during the latter stages of his career — had he missed a few games due to injury and not re-assumed his spot in the lineup. In any event, Trestman didn’t have much of a choice. From the moment Cutler went down, first with a groin injury in Week 7, then with a more debilitating high ankle sprain in Week 10, Trestman pledged that Cutler would get his job back when he got his health back. Trestman made the decision weeks ago. To go back on his word at this point might have ruined whatever level of credibility in the locker room he has established as a first-year coach. He could not have known that McCown would instantly turn into Dan Fouts in sparking victories in three of the past four games, but to cash in his word at this point might have fueled another debate about trust and leadership. Sure, they need to win. And there are many coaches who would flip the script in a heartbeat. Yet there is much to be said for trying to win with principles. This brings to mind the chat that I had with Trestman during the Bears’ training camp in August. Even as he was trying to establish a new program with the Bears, he told me that he was staying in touch – through text-messages – with several of his former players with the CFL Montreal Alouettes. The way he put it, even though he had left for the NFL, he was invested in the people he left. This is not something you hear often from NFL coaches. You are currently reading Bell Tolls: Marc Trestman’s decision to return to Jay Cutler bears watching at ARE YOU NEXT.